I used to never actually do anything with fresh cherries besides eat them because I didn’t own a cherry-pitter and figured that it would be way too much work to actually make anything substantial from them. But in recent years I’ve discovered that fresh cherries not only taste amazing in homemade food, but they’re pretty easy to work with too. It really doesn’t take that long to pit large quantities of cherries, and it will go even faster if you can recruit a few more hands! There are lots of fairly inexpensive cherry-pitting gadgets like this that will pop that pit right out. 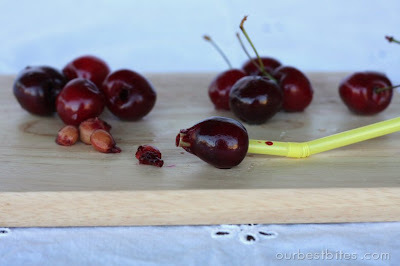 But if you don’t use cherries enough to invest in a tool like that, just do it the old fashioned way. Actually, I’m not sure what people did in the old days, but I’m guessing it was something like this! 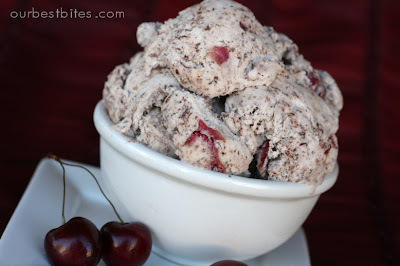 I’ve experimented a lot of ways to pit a cherry and I’ve found things that work for me. I know a lot of people say you can use a paper clip but I’ve never had much luck with that. Here’s a simple way to do it with a straw. The blunt end of a bamboo skewer works great too, and actually I think my new favorite is a chopstick. I’ve actually been using skewers and chopsticks more than straws lately because they’re stronger and hold up a little better. Use what you have; be resourceful! Have your cherries nearby. Well, obviously. 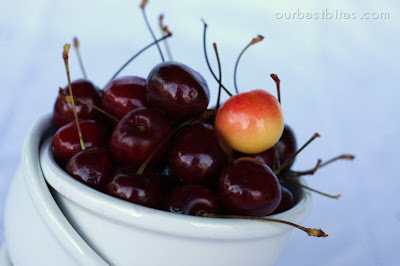 I put my cherries in one bowl in front of me and then I put an empty bowl on either side of it. Remove the stem from the cherry and you have a perfect little indentation just waiting to be stabbed. See? If you’re right handed, grab a cherry with your left hand and the straw or skewer in your right. Holding both firmly, poke the straw/skewer through until it hits the pit. Then just give it a push and it will pop right out the other side. You’re then left with a “pretty” cherry, fully in tact just without the pit. Bulls eye. Once you get your rhythm down it goes pretty quickly. I pit the cherry and then catch the pit with my left hand and put it in the empty bowl on that side, and toss the cherry in the bowl on the right and just keep on truckin‘. or just save them for later. To freeze, place in a single layer on a baking sheet and freeze until solid. Once frozen, put in ziplock bags to store. I never would have thought of that! Thanks for posting. I usually pit them with my mouth. But the obvious downside is that I then have to eat them (which is not too bad of a downside) and they don't make it into delectable creations like chocolate cherry ice cream or cherry pie. totally timely post! 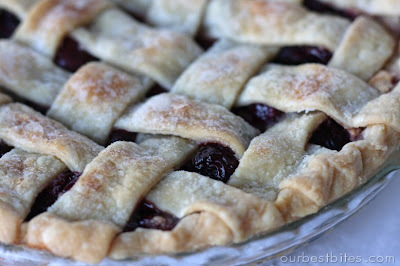 i have a ton of cherries downstairs begging to be made into a pie! Rock on! I was just debating if I really needed to go buy a cherry pitter… you just saved me some coin, thank you! OMG…had no idea it can be that easy. 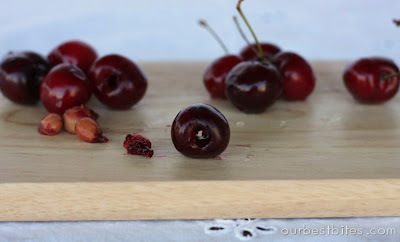 I've been wanting to make a cherry clafoutis, but am too lazy to go buy a cherry pitter. That's the least of my problems now. Great tip! This will come in handy when pitting cherries for my kids to eat. It's always so messy to hand them a cherry I mutilated (sp??) by digging out the pit with my fingers. it's like magic! I don't have bamboo skewer or straw, so I used chopstick instead and it worked wonderful! thanks for the idea! Again thanks for the great tips. I just bought a huge bag and my little ones weren't that interested in them. I guess I will be whipping up something else then! We'll see how they enjoy a pie or cobbler or ice cream! 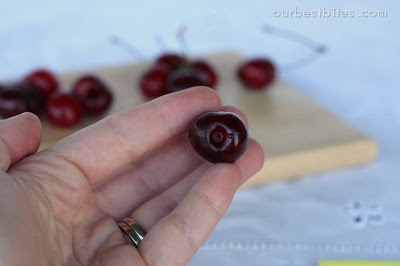 Thank you for this simple method to pit a cherry. 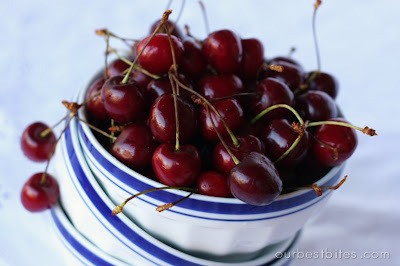 I enjoy eating cherries and recently started adding them to my morning bowl of oatmeal along with some chopped walnuts. This will make the process so much easier. 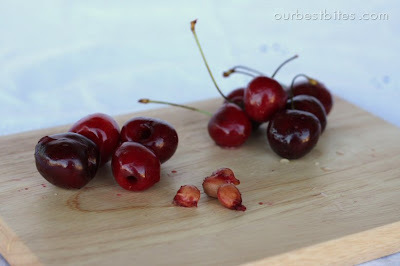 I want to buy a good cherry pitter (we havev 15 trees). What is the best?